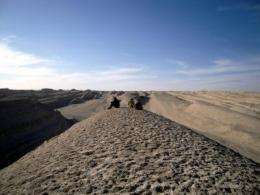 Researchers sit atop a wind-formed ridge called a yardang located in the Qaidam Basin of Central Asia. The yardangs in that area can be as much as 40 meters (about 130 feet) tall and about a football field (100 meters) apart. Credit: Paul Kapp, University of Arizona. Wind is a much more powerful force in the evolution of mountains than previously thought, according to a new report from a University of Arizona-led research team. Bedrock in Central Asia that would have formed mountains instead was sand-blasted into dust, said lead author Paul Kapp. "No one had ever thought that wind could be this effective," said Kapp, a UA associate professor of geosciences. "You won't read in a textbook that wind is a major process in terms of breaking down rock material." Rivers and glaciers are the textbook examples of forces that wear down mountains and influence their evolution. Wind can be just as powerful, Kapp said. He and his colleagues estimate wind can be 10 to 100 times more effective in eroding mountains than previously believed. The team's paper, "Wind erosion in the Qaidam basin, central Asia: implications for tectonics, paleoclimate, and the source of the Loess Plateau," is in the April/May issue of GSA Today. Kapp's co-authors are Jon D. Pelletier and Joellen Russell of the UA; Alexander Rohrmann, formerly of the UA and now at the University of Potsdam in Germany; Richard Heermance of California State University, Northridge; and Lin Ding of the Chinese Academy of Sciences, Beijing. The American Chemical Society Petroleum Research Fund and a UA Faculty Small Grant funded the research. The geoscientists figured out wind's rock-sculpting abilities by studying gigantic wind-formed ridges of rock called yardangs. Kapp first learned about yardangs when reviewing a scientific paper about Central Asia's Qaidam Basin. To see the geology for himself, he booted up Google Earth -- and was wowed by what he saw. "I'd never seen anything like that before," he said. "I didn't even know what a yardang was." Huge fields of yardangs that can be seen from space look like corduroy. Wind had scoured long gouges out of the bedrock, leaving the keel-shaped ridges behind. Kapp wondered where the missing material was. This map shows Central Asia's Qaidam Basin, Gobi Desert and Loess Plateau. A research team led by University of Arizona geoscientist Paul Kapp suggests that during glacial times, winds blew dust and from the Qaidam Basin to the Loess Plateau and deposited more than half of the dust currently in the Loess Plateau. During interglacial times such as the present, the westerly winds shift north and blow dust from the Gobi Desert to the Loess Plateau. Credit: Paul Kapp, University of Arizona. The team's initial research was conducted using geological maps of the region and satellite images from Google Earth. Then Kapp and his team went to the Qaidam Basin to collect more information about the yardangs, the history of wind erosion and the dust. "What we're proposing is that during the glacials, when it's colder and drier, there's severe wind erosion in the Qaidam basin and the dust gets blown out and deposited downwind in the Loess Plateau," Kapp said. The term "loess" refers to deposits of wind-blown silt. Parts of the U.S. Midwest have large deposits of loess. "Up until 3 million years ago, the basin was filling up with sediment," he said. "Then like a switch, the wind turned on and basin sediments get sandblasted away." Known as the "bread basket of China," the Loess Plateau is the largest accumulation of dust on Earth. Scientists thought most of the dust came from the Gobi Desert. In contrast, Kapp and his colleagues suggest more than half of the dust came from the Qaidam Basin. Co-author Pelletier, a UA geomorphologist, created a computer model indicating that dust from the basin could have formed the plateau. The wind is not having such effects now because the climate is different, Kapp said. Co-author Russell plus other research groups suggest the westerly winds shift north during interglacial periods like that of the current climate and shift toward the equator during glacial periods. Therefore since the last Ice Age ended about 11,000 years ago, the winds have blown from the Gobi Desert toward the Loess Plateau. During glacial periods, the winds blew from the Qaidam basin toward the Loess Plateau instead. "During the interglacials, the basin fills up with lakes. When it goes back to a glacial period, lake sediments blow away," he said. "Our hypothesis is that you have lake development, then wind erosion, lake development, wind erosion, lake development  and so on." The team suggests wind erosion also influenced how fast the basin's bedrock is folded. In Central Asia, bedrock folds and crumples because it's being squeezed as the Indian plate collides with the Asian plate. "The folding accelerated 3 million years ago," Kapp said. "That's when the wind erosion turned on. I don't think it's a coincidence." During the glacial periods, the winds whisked sediment out of the basin. As a result, the bedrock deformed faster because it was no longer weighed down by all the sediment. Kapp calls the process "wind-enhanced tectonics." The term "tectonics" refers to forces that cause movements and deformation of the Earth's plates. The whole process is driven by global climate change, he said. "The unifying theme is wind." Kapp and his team are quantifying the processes further as they analyze more samples they brought back from the Qaidam basin and Loess Plateau. Can you say dust bowl x1000? This might be a good thing since the ocean is slowly munching up our land.